I’m back with part 2! 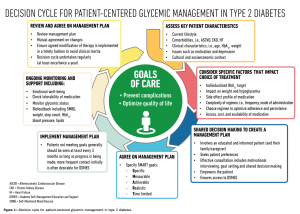 The discussion is about the new 7-point approach to treating people with type 2 diabetes. Click here for part 1, if you missed it. Here’s an image of the entire cycle and below it are my thoughts on the remaining four parts. The fourth step asks healthcare providers to agree on a plan that has S.M.A.R.T (Specific, Measurable, Achievable, Realistic, Time Limited) goals. I started an annual goal setting routine years before my diabetes diagnosis and realized that I thrive best with short-term goals that are feasible for me to reach. For example, there are times when reaching a weekly exercise goal of one-hour for five days a week comes easy. Then there are other times when the most that I can do is get through the gym’s door three days per week for an unspecified time. Being able to set goals that I can achieve not matter what’s going on in my life is vital to my emotional health because I’m happy when I reach goals and saddened when I don’t. The fifth step asks healthcare providers to meet with patients every three months or earlier if needed. For years, I didn’t think I could meet with my endocrinologist before 90 days. I am not sure if I felt that way because of my medical insurance, reading material about A1C results happening every three months, the high-priced co-pay ($75 for seeing a specialist), never receiving an invitation to come back sooner if I needed to do so, or all of the above. Thankfully my current endocrinologist always says, “You come back as soon as something isn’t working well,” whenever there is a change in my management routine. I remember the first time she said that, I thought, “Can I really come back before three months?” She must have sensed my hesitation and decided to write my prescription for two months, which forced me to come in early. This was the right call at the time because that plan didn’t work for me and we were back to the drawing board within 60 days. The sixth step asks healthcare providers to monitor emotional wellbeing, tolerability of medication, step count, and other aspects of the person. I can’t stress enough just how much I enjoy reading that this new plan asks healthcare providers to move beyond reading only my blood results and see me as a person. Step 7: Review and Agree on Management Plan. Lastly, the seventh step asks healthcare providers to review the plan in a timely fashion and repeat the cycle at least once/twice per year. It is critical that my management plan changes with me. I’m not the same person I was when I was first diagnosed. I was living alone then and could master a routine. Now, I’m the mother of a toddler which means I can’t even control how many hours of sleep I get each night. It’s harder for me to stick to routines and my diabetes management plan must account for my new normal. When I look at the recommendation cycle, I am eager for the day that these recommendations become standards of care for everyone. While some people are experiencing this level of care now others can only dream of the day when this will be their experience. I fall somewhere in the middle having had various encounters with a few healthcare providers over the past eight years since my diagnosis. Although the 7-point management approach is targeted to healthcare providers, it was also an encouraging reminder for me to be more active and vocal during medical visits. If I am experiencing diabetes burnout or training for another 5k race, I can and should bring those aspects of my life into the appointment. I’m looking forward to seeing these suggestions manifest in diabetes care for people with type 2 diabetes and across the entire healthcare industry, what about you? *Disclaimer: The time spent writing this blog post was sponsored by Novo Nordisk. All content represent my own opinions. Step number 7 seems the most difficult. Agree on Management Plan – seems to be different than what many doctors choose to do. Instead they seemed called on to prescribe and not bend. But worse than doctors, are patients. Some of us look at doctors as some manner of God, and when we disagree we vote with our feet to a new doctor. We need to learn to disagree by using our words more and our feet less often.